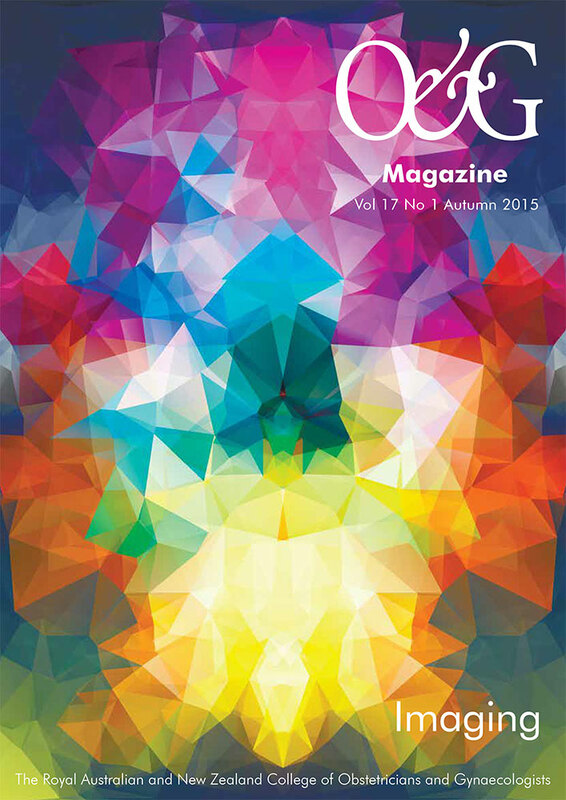 The many uses of magnetic resonance imaging in obstetrics and gynaecology. Ultrasound is the modality of choice for screening the fetus. Since the late 1990s, magnetic resonance imaging (MRI) has evolved as a useful modality for problem solving in selected cases in which ultrasound has identified an abnormality, or raised the possibility of an abnormality. The MRI examination should be undertaken in close collaboration with the treating obstetric team and with review of the ultrasound imaging. 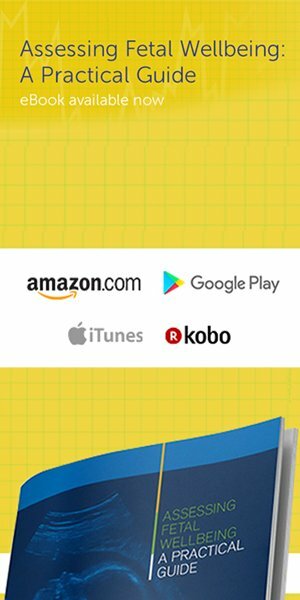 With the development of echo planar imaging, MRI techniques with high spatial resolution and excellent contrast resolution are now available. Rapid sequences can be obtained in order to adequately capture fetal images, without motion degradation. High spatial resolution images are required in order to assess the small anatomic structures of the fetus. To date, no deleterious effects of MRI imaging of the fetus have been documented. The American College of Radiology states that pregnant patients can be accepted to undergo MRI scan at any stage of pregnancy if the risk-benefit ratio to the patient (assessed by the MRI radiologist) warrants the study be performed. Of note, MRI contrast agents should not be routinely administered to pregnant women. 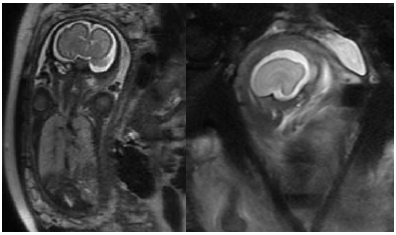 Venticulomegaly, where MRI can confirm the presence of ventriculomegaly and identify associated anomalies such as agenesis of the corpus callosum or malformations of cortical development. Posterior fossa abnormalities, such as Chiari II and Dandy Walker malformations. Ischaemic and vascular abnormalities. Diffusion-weighted imaging demonstrates acute infarction. The sequelae of infarction may be evident in cases of twin-to-twin transfusion syndrome. Intrauterine infection, in particular, cytomegalovirus. MRI may demonstrate volume loss and cortical malformation. Spinal anomalies, including neural tube defects, caudal regression and vertebral anomalies. Figure 1 a. (left) coronal; and b. (right) sagittal images of a 27/40 gestation fetus, with an interhemisheric cyst identified at antenatal ultrasound. MRI demonstrates lack of normal sulcation. There is minimal infolding of the Sylvian fissures; the frontal cortex is abnormally smooth, in keeping with lissencephaly. Placenta accreta has increased in incidence as the numbers of caesarean deliveries have increased. Patients with placenta previa and a history of caesarean section have a 25–50 per cent incidence of placenta accreta.1 Ultrasound is the diagnostic standard for fetal assessment and routine examinations at 18 weeks gestation provide an opportunity to screen for abnormal placentation. On ultrasound, placental lacunae and abnormal colour Doppler are the typical features of placenta accreta. Dwyer et al have shown that ultrasound and MRI have similar accuracy in the diagnosis of placenta accreta.2 In cases where there is uncertainty or difficulty in assessing posterior placentas, MRI has been used to provide additional information. MRI may be obtained at 1.5 or 3T. A phased array surface coil is placed over the maternal abdomen. T2 weighted sequences in axial, sagittal and coronal planes are obtained. Breath-hold techniques are used. Volumetric sequences are useful. 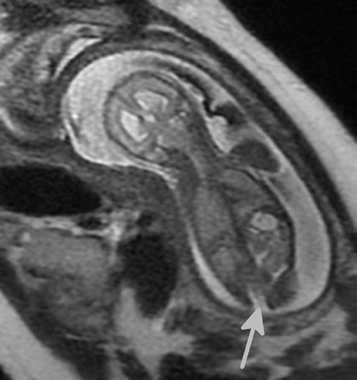 The typical signs of placenta accreta on MRI are uterine bulging, heterogeneous signal within the placental tissue and placental bands. Focal discontinuity in the myometrial border has been described and may be identified. The diagnosis may be difficult even with high-quality ultrasound and MRI examinations. In later pregnancy, the myometrium thins and it may be difficult to visualise at MRI, and therefore difficult to accurately assess the interface between the myometrium and placenta. 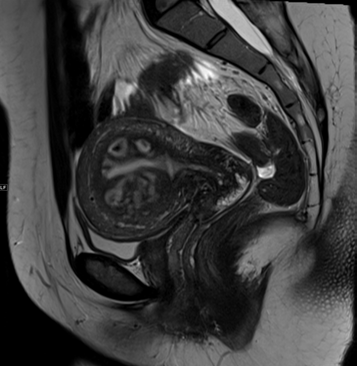 MRI has particular utility in the assessment of extrauterine extension of placental tissue in cases of placenta percreta. Evidence of the placenta directly invading or distorting the bladder is highly specific for placenta percreta. lumbar level (arrow), and enlarged lateral ventricles. Figure 3. A 32-year-old female patient with history of LSCS, presenting with ultrasound consistent with placenta percreta: note a. (left) the intraplacental dark bands (arrows); and b. (right) low lying placenta, covering the internal os of the cervix (arrow). MRI is complementary to ultrasound in the localisation and characterisation of adnexal lesions. MRI helps to characterise indeterminate ovarian masses on ultrasound, giving a likelihood of malignancy which can affect the subsequent management plan. Several of the MRI features of ovarian malignancy are similar to ultrasound features (thick multiple septations, mural nodules, vascularity and ascites). The post-contrast sequence on MRI allows better distinction between non-enhancing fibrinous debris or clot from the enhancing neoplastic solid nodules, which may have a similar appearance on ultrasound. MRI also assesses the signal intensity of the ovarian mass with inference to the composition and histology of the mass. 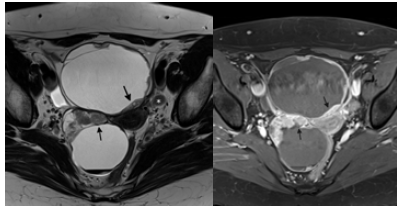 Some benign ovarian lesions (endometrioma, dermoid, fibroma, fibrothecoma and cystadenofibroma) have specific MRI appearances and can be diagnosed with high specificity and confidence.5 The identification of these benign features on MRI could aid in the decision-making in limited surgical approach or conservative management. An advantage of MRI over ultrasound is its larger field of view, which is not limited by lesion size or body habitus. Large cystic lesions greater than 7cm may benefit from an MRI, owing to the difficulty to assess the cyst in its entirety on ultrasound. Novel MRI sequences, including diffusion-weighted imaging and perfusion-weighted imaging, offer potential additional tools for ovarian lesion characterisation. Their clinical role is however still being established. Figure 4. A 60-year-old woman with bilateral serous cystadenocarcinoma: a. 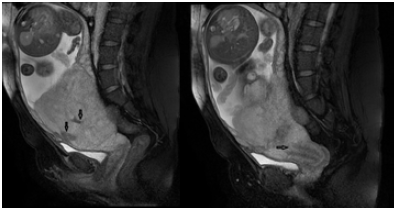 (left) an axial T2 weighted image shows bilateral cystic ovarian lesions with mural nodules (arrows) as well as left obturator lymphadenopathy; b. (right) an axial T1 post-contrast image shows enhancement of the mural nodules in keeping with enhancing solid neoplastic tissue. MRI is useful in the preoperative diagnosis and mapping of sites of deep invasive endometriosis (DIE) and accurate characterisation of endometriomas. MRI is limited in the assessment of superficial peritoneal implants. DIE elicits fibrous scar formation from repeated haemorrhage. 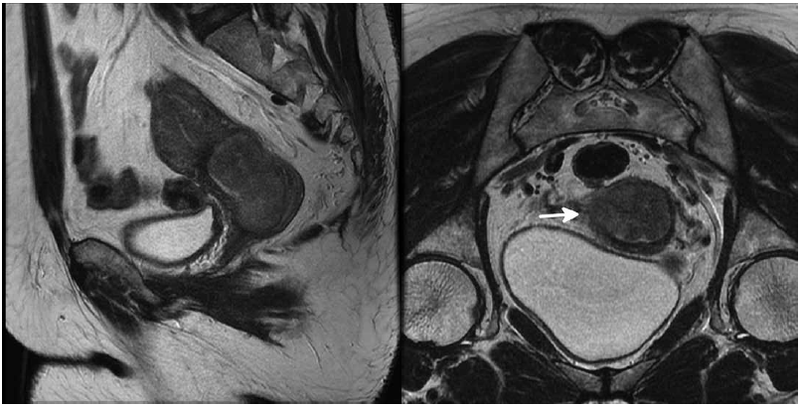 The associated endopelvic fascia scarring, particularly of the uterosacral ligament is visible on MRI. With involvement of the adjacent organs, DIE manifests as markedly T2W dark fibrous plaques with multiple T1W bright haemorrhagic areas. The performance of MRI in the preoperative diagnosis of endometriosis is dependent on the location. The highest accuracy of MRI is in bladder endometriosis with high negative predictive value.6 MRI can have similar performance as transvaginal ultrasound with bowel preparation in the detection of rectosigmoid endometriosis.7 The advantage of MRI is its large field of view, which allows complete assessment of multiple pelvic sites as well as extrapelvic disease. Figure 5. A 28-year-old woman with uterovesical endometriosis with bladder detrusor muscle invasion: a. (left) a sagittal T2 weighted image shows the uterovesical fold endometriosis (arrows) with small bright cystic glandular areas – the bladder mucosa is overlying the plaque and intact; b. (right) a sagittal T1 weighted image shows the T1 bright signal (arrows) associated with the endometriosis due to haemorrhage. Endometrial cancer size, depth and presence of myoinvasion, cervical stromal involvement and nodes can be assessed with accuracy on MRI and many centres in the UK and Europe use MRI for staging.8 Computed tomography (CT) of the abdomen and pelvis has similar accuracy to MRI for determining lymph node involvement.9 In Australia, where endometrial cancer is staged surgically, preoperative CT is used in preference to MRI for nodal staging, owing to cost and availability. Treatment consists of hysterectomy and, for some women, lymph node removal for staging. Stage, together with histologic subtype and grade stratify risk and treatment. Young women with early grade 1 cancer who wish to preserve their uterus may be candidates for MRI. If there is no evidence of myoinvasion or spread to cervical stroma, these women can be treated with hormone therapy. The very elderly or medically unfit may not be surgically staged and MRI may help with decisions regarding the use of brachytherapy. MRI may have a role in determining the mode of performing the hysterectomy in a low-risk patient, though parity and other clinical factors may be as relevant in determining suitability for a vaginal hysterectomy, for example, as tumour stage. MRI can be used to differentiate leiomyoma from malignant mesenchymal tumours. Criteria such as single tumour, extra-myometrial tumour, abnormal endometrium and age can be applied using MRI or ultrasound. However, ultrasound may have limitations in discrimination of large masses. Size, MRI signal characteristics and irregular margin can suggest the diagnosis of sarcoma. MRI techniques such as diffusion-weighted imaging may show a tendency to low apparent diffusion coefficient (ADC) value of malignant mesenchymal tumours compared to leiomyoma.10 MRI may also be helpful in differentiating a pedunculated fibroid from an adnexal mass and distinguishing a fibroid from adenomyosis. Figure 6. A 47-year-old woman with a suggested diagnosis of uterine sarcoma on CT scan. A sagittal T2 weighted image shows uniform cystic change which conforms to the junctional zone of the uterus owing to adenomyosis. The current FIGO cervical cancer staging classification is based on clinical staging and does not include lymph node assessment. Clinical staging has been shown to be inaccurate with accuracy of tumour size <60 per cent and parametrial involvement 29–53 per cent compared to MRI with accuracy of 93 per cent and 88–97 per cent, respectively.11 Therefore, MRI is used routinely in developed countries. Early disease (stage 1B and IIA) can be distinguished from advanced disease on MRI and treated surgically. MRI can define pelvic sidewall disease, bladder and rectal involvement and nodes to assist with radiotherapy planning of advanced disease. Figure 7. A 53-year-old woman with cervical cancer: a. a sagittal T2 weighted image shows a cervical mass with extension along the posterior wall of the endocervix measuring just over 4cm; and b. an oblique coronal T2 weighted image shows extension through the cervix into the parametrium with disruption of the low T2 signal cervical stroma on the right (arrow). Miller DA, Chollet JA and Murphy Goodwin T. Clinical risk factors for placenta previa-placenta accreta. Am J Obstet Gynecol. 997;177:1:210-214. Dwyer BK, Belogolovkin V, Tran L, Rao A, Carroll I, Barth R et al.Prenatal Diagnosis of Placenta Accreta. Journal of Ultrasound in Medicine. 2008;27:1275-1281. Griffin N, Grant LA, Sala E. Adnexal masses: characterization and imaging strategies. Seminars in Ultrasound, CT, and MRI. 2010;31(5):330-46. Anthoulakis C, Nikoloudis N. Pelvic MRI as the”gold standard” in the subsequent evaluation of ultrasound-indeterminate adnexal lesions: a systematic review. Gynecologic Oncology. 2014;132(3):661-8. Kruger K, Behrendt K, Niedobitek-Kreuter G, Koltermann K, Ebert AD.Location-dependent value of pelvic MRI in the preoperative diagnosis of endometriosis. European Journal of Obstetrics, Gynecology, and Reproductive Biology. 2013;169(1):93-8. Bazot M, Lafont C, Rouzier R, Roseau G, Thomassin-Naggara I,Darai E. Diagnostic accuracy of physical examination, transvaginal sonography, rectal endoscopic sonography, and magnetic resonance imaging to diagnose deep infiltrating endometriosis. Fertility and Sterility. 2009;92(6):1825-33. Duncan KA, Drinkwater KJ, Frost C, Remedios D, Barter S. Staging cancer of the uterus: a national audit of MRI accuracy. Clinical Radiology. 2012 Jun;67(6):523-30. Freeman SJ, Aly AM, Kataoka MY, Addley HC, Reinhold C, Sala E. The revised FIGO staging system for uterine malignancies: implications for MR imaging. Radiographics. 2012 Oct;32(6):1805-27. Bonneau C, Thomassin-Naggara I, Dechoux S, Cortez A, Darai E, Rouzier R. Value of ultrasonography and magnetic resonance imaging for the characterization of uterine mesenchymal tumors. Acta Obstetricia et Gynecologica Scandinavica. 2014 Mar;93(3):261-8. Lakhman Y, Akin O, Park KJ, Sarasohn DM, Zheng J, Goldman DA, et al. Stage IB1 cervical cancer: role of preoperative MR imaging in selection of patients for fertility-sparing radical trachelectomy. Radiology. 2013 Oct;269(1):149-58. Balleyguier C, Fournet C, Ben Hassen W, Zareski E, Morice P, Haie-Meder C, et al. Management of cervical cancer detected during pregnancy: role of magnetic resonance imaging. Clinical Imaging. 2013 Jan-Feb;37(1):70-6.